Quantifying and assessing the impact of potential economic shocks is an inexact undertaking. Going the whole hog and assigning them a probability whilst cloaked in the garb of academia, though, makes the exercise much more impressive. And often more inexact. In 1987 this scribe had an undergraduate course with an internationally known historian and expert on Nazism and contemporary European politics. Deeply knowledgeable, the professor opined that Germany would not be reunited in his lifetime (he was a young chap then). Well, he's still breathing and junior readers may need to google historic artefact “the Berlin Wall 1989” for more information. A forecast, expert or not, hazarded upon a chaotic (as opposed to linear) environment is a hostage to fortune. Which is what makes reading the Oxford Analytics Global Stress Points table (above left, click for larger image) such wonderful entertainment. Released in January it from the start contained a mix of de facto events not warranting a probability rating (“civil war” in Iraq pre-dates 2006, and just how much more nationalist could Mr Putin's regime be?) with standard tabloid fare (dirty bomb, avian flu, oil shock). There is also a 4am-and-the-beer-keg-just-ran-dry choice (“collapse of the euro”); and anyone who has spent more time than they care to recall reading about avian flu will wonder how the “scholar-experts” came up with a 55% likelihood of it hitting this year (it must be an interesting formula). Nonetheless, two overlapping items merit special attention: an “oil price shock” and a “US strike on Iran”. It is curious there is no “Israel strike on Iran” option for the Israeli government has been talking openly about it since 2002 with an eye to conditioning sympathetic listeners to such an eventuality. 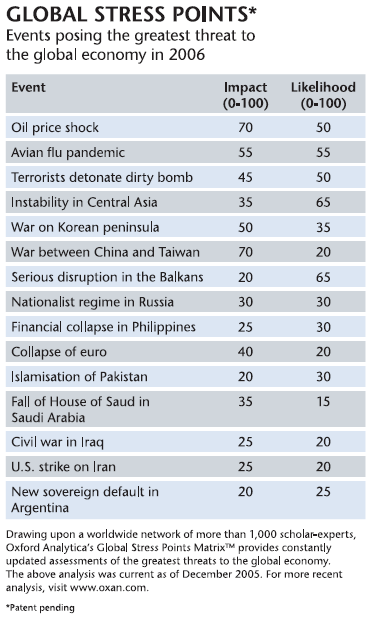 In either event, timing a US and/or Israeli strike as a function of Iran's point-of-no-return in acquiring nuclear bomb-making knowledge (but not the weapon itself) has brought the matter to a head: if the 2007 Global Stress Points table carries similar scores for a strike as in the 2006 edition then the “scholar-experts” will be rating the likelihood of the risk too low. And if ever an international diplomatic triumph was required it is on this issue. One wonders what that list would look like in October of 1962, for example.